On a parchment lined baking sheet or silicone mat place 1 tablespoon grated cheese forming it into a 2-inch round or oval. Repeat this process until you have eight, spacing them 2 inches apart. Bake for 3 to 5 minutes or until lightly brown. Remove from oven with a spatula. Working quickly, form each into cone shapes to make a tuile. If cheese becomes too brittle, return to oven for 1 minute to soften. They can be made two days ahead; store covered at room temperature. 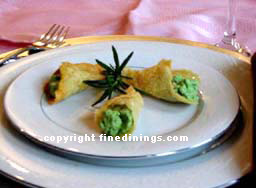 In a food processor puree peas, mint, creme fraiche or sour cream and salt together until smooth. Transfer to a small bowl, cover and freeze. Puree again and return to freezer to set. Pipe or spoon sorbet into the tuiles and serve immediately.